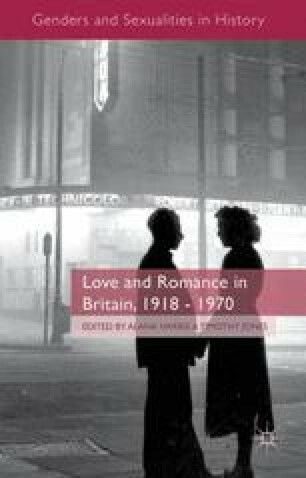 In 1980, historian and feminist Elizabeth Wilson commented in her account of women in postwar Britain that ‘the romantic myth still holds sway, not as a form of “conditioning” which can be stripped off, peeled away, but inside us, part of us’.1 Implicit in her comment was an understanding of romantic love as a culturally constructed ‘myth,’ rather than a biochemical embodied event. This perspective was opposed to a common sense perception of romantic love as natural, happening regardless of social mores and sexes, part of being human though more central to the lives of women than those of men. Natural or biological behaviour was understood as fixed and unchanging but, if behaviour was socially constructed, it was open to change. Wilson was expressing a new feminist realization that an individual woman’s awareness that feelings and beliefs were formed by infant and child socialization did not enable her to slough them off in favour of alternative emotions.